The BodyWorx HD half rack is the perfect addition to any commercial gym, or home studio set up. The L870HR offers thicker commercial grade tubing (70 x 70 x 3.0) for peace of mind and added security. The extra long reinforced safety catches and easily adjustable j hooks, make the Rack a fantastic option for those people who train without a partner. The rack can be thought of as a one way station, and allows for primary exercises such as squats, bench press, barbell rows and deadlifts. A wide, non slip, multi grip pull up bar is an added feature, and compliments the racks heavy duty construction. To save space, eight olympic sized plate loading stations are available offering an easy storage solution. The rack comes with a high quality two tone metallic powder coating and is backed by a BodyWorx lifetime frame warranty. Buy Bodyworx Heavy Duty Half Rack (L870HR) online. 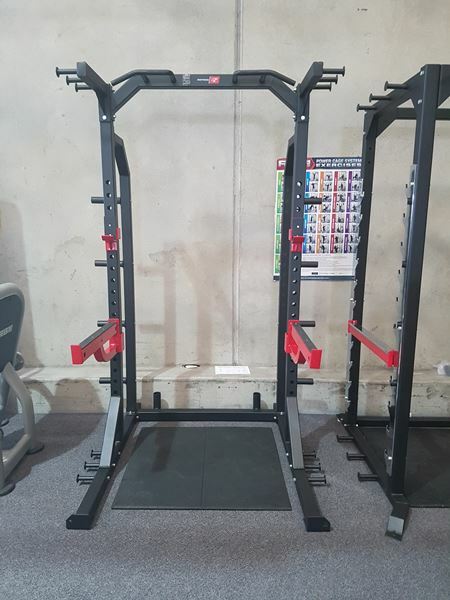 If you are interested in the Bodyworx Heavy Duty Half Rack (L870HR) for sale, feel free to enquire above.